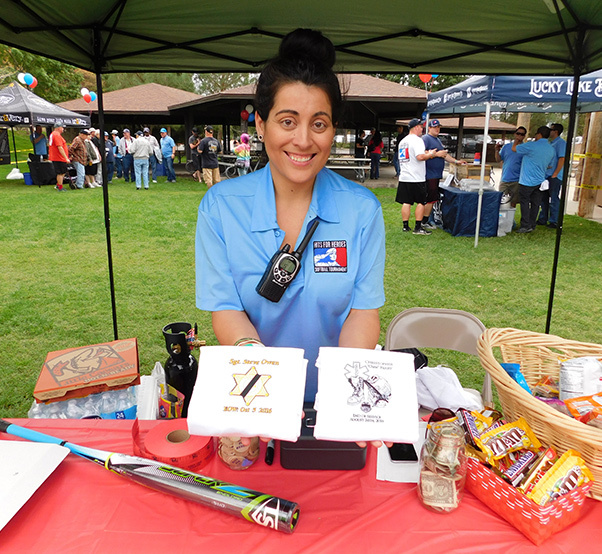 Alexandrea Ballentine, a volunteer at the Hats off for Heroes softball tournament sells T-shirts honoring two Antelope Valley fallen heroes. 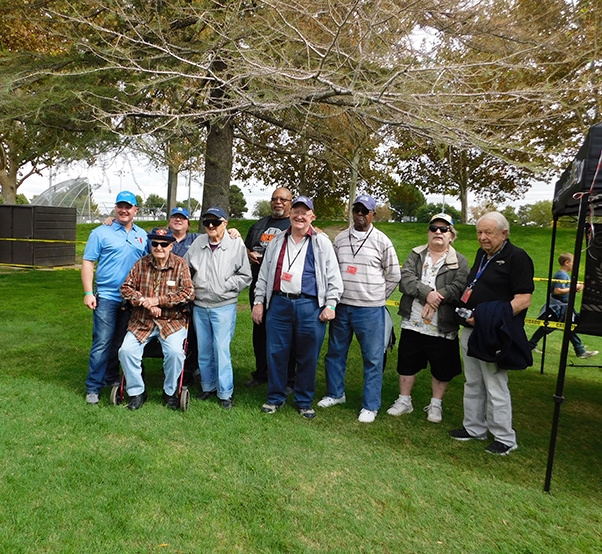 Resident veterans from the William J. 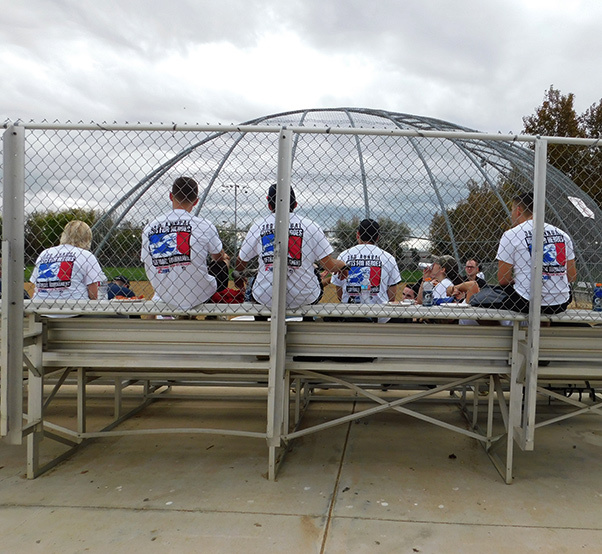 “Pete” Knight Veterans’ Home in Lancaster, Calif., were treated to a day of fun and relaxation at the third annual Hits for Heroes softball tournament Oct. 28. The all-day event was sponsored by the American Medical Response, Antelope Valley’s first responders’ emergency medical team and held at the Lancaster City Park. The festivities began with the Blue Eagles Honor Guard posting colors followed by Rep. Steve Knight of the House Armed Services Committee with opening remarks. The entire event was run by volunteers explained Tech. Sgt. Michael Burd, senior adviser, for Chapter 1328 of the Air Force Sergeants Association. The Lucky Luke Brewing Company and the Bravery Brewing Company each set up booths and sold beer by the glass in an effort to raise money for the local veterans’ home. Another booth offered personalized T-Shirts for sale. Veterans from the William J. “Pete” knight Veterans Home in Lancaster, Calif., enjoy a day of softball games at Lancaster Park. Burd, who was overseeing the event and ensuring all booths were operating smoothly, said 50 percent of proceeds from the sale of beverages was going to the veterans’ home for its Quality of Life Program and 50 percent of sales from T-shirts were going to the families of two local fallen heroes. One T-shirt honored Sgt. Steve Owen of the LA County Sheriff’s Department who was killed while responding to a domestic dispute. Deputy Owen was shot five times and died at the scene. EMP Christopher “Chris” Parry, an AMR team member, was killed in a traffic accident and his memory was also being honored. Eight veterans from the local veterans’ home were there to cheer on the numerous softball teams and enjoy the day’s activities. “It’s such a nice break from the day,” said one resident veteran who preferred not to see his name in print. The home offers us a variety of outings, it’s a neat place to live,” he said. “We try to keep our residents active in the community,” offered Lawrence Hawkins, the facility’s supervising rehabilitation therapist. 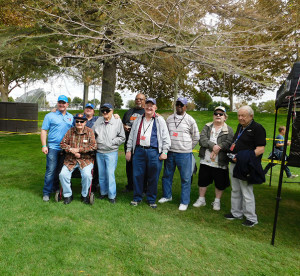 “The vets started their day enjoying an antique car show,” he said, explaining that the Antelope Valley chapter of the Automobile Club of America brought several antique cars to the veterans’ home. “They brought some Ford Model A’s and T’s, an old Plymouth and a Woody for the vets to check out,” he said, giving the impression that he enjoys the day to day activities as much as the resident veterans do. Hawkins praised the Antelope Valley community saying many of its citizens and businesses support the home both monetarily and by volunteering their services. 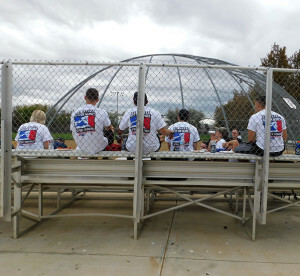 Play Ball — Spectators sporting T-shirts designed to honor two local fallen heroes watch the teams warm up for the games. The softball tournament was a big success, “We more than doubled what we took in last year,” said Burd, who said they collected $7,500. 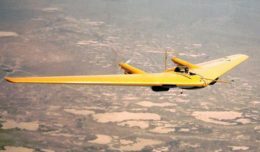 “Fifty percent of that goes to the Veterans’ Home and the other half goes to the Air Force Sergeants’’ Association,” he said.